Curran, Maher, McCarthy and Cahill are all on the treatment table for Tipperary. IT’S JUST UNDER a month since Liam Sheedy’s appointment was rubber-stamped in Tipperary, the second time that he would take the senior hurling managerial reins in the county. The first competitive shots will not be fired under his watch until late January next with a Saturday night pencilled in for a league opener against Clare. The serious stuff in Munster will not commence until mid-May, Cork first up in a series of provincial battles. At the moment the focus for Sheedy may be on assembling the range of individuals who will assist him in coaching roles next season or keeping a watching brief on club matters – next Sunday is county final day in Tipperary, a relatively novel occasion given the stranglehold Thurles Sarsfields have exerted of late, with both Nenagh Éire Óg and Clonoulty-Rossmore aiming to halt barren spells that stretch back over two decades. And yet another headache presented for Sheedy is the spate of long-term injuries that have struck down Tipperary players. Of the squad that competed in this year’s Munster championship, four are presently embarking on or in the midst of recovery from cruciate ligament injuries. When Tipperary made their exit against Clare in June, the bad vibes emanating from that game were worsened by the sight of Brendan Maher hobbling off during the second half. It was confirmed in the days after that game that his cruciate had snapped and by the end of July emerging player Billy McCarthy had also suffered a similar injury, albeit his was more severe after dislocating his knee and tearing his cruciate in a club hurling game. In early August, forward Sean Curran was hit with the cruciate setback while in action at club level and now news has emerged of defender Michael Cahill incurring the same injury. Best wishes to Tipp and @thurlessars hurler Michael Cahill as he recuperates from a serious cruciate knee injury picked up on duty with Sars in the club championship recently. Cahill must head down the same comeback route as his Thurles Sarsfields club-mate McCarthy. He damaged his knee during last Sunday week’s county semi-final as their reign as the kingpins of Tipperary ended at the hands of Nenagh Éire Óg. The 29-year-old attempted to play on after the initial knock before accepting defeat and aided by medical staff as he departed the Semple Stadium pitch. When Tipperary’s 2018 involvement concluded both Maher and McCarthy were in the thick of the action as they started against Clare. The previous outing against Waterford had seen them joined in the starting side by Cahill with Curran flung into the game as a second-half substitute. Sheedy will be well aware of the capabilities of Maher and Cahill. They are part of a group in the Tipperary setup that he has forged a successful relationship with. Corner-backs on the minor side he steered to All-Ireland glory in 2006, they were members of a dynamic young wave that Sheedy drafted into his successful senior side in 2010. The pair both turn 30 in January but are part of an experienced core Sheedy is likely to utilise as he plots for 2019. When speaking to The42 in August, Maher was unwavering in his belief about mounting a comeback. “I would say yeah I’ve a lot of hurling done but this year physically I felt excellent and mentally the hunger is 100% there. 27-year-old Curran has been a regular squad member for Tipperary who operates in the middle third and 22-year-old McCarthy emerged brightly in this campaign, netting in that loss to Clare from his centre-forward berth. With a few months rehabilitation behind him, Maher has the best shot at featuring heavily next year with the recency of his injury a hindrance for Cahill and the severity of McCarthy’s making his comeback particularly arduous. But for all four players it is a major setback to contend with at a time when a managerial change would have accelerated their motivation to make a case for selection in the new man’s plans. It all adds up to the sense that there will be a fresh start under Sheedy’s tutelage. Maher and Cahill were part of six players remaining from the squad of their manager’s last game in charge, that epic 2010 decider against Kilkenny. Padraic and Patrick Maher, Noel McGrath and Seamus Callanan are the other survivors. The number of serious injuries is another challenge for Sheedy to contend but by any metric, Tipperary have promising underage raw materials to work with. They claimed a notable surprise triumph at U21 level in August and have won two of the last seven All-Ireland minor crowns. A new manager is always likely to offer new playing candidates the chance to impress. 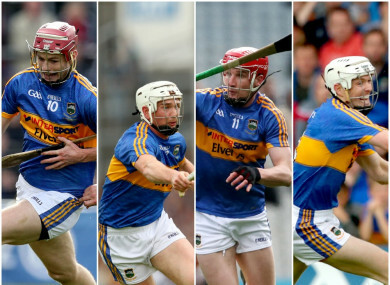 The injury travails of established members heightens the likelihood of a different era taking place in Tipperary hurling next season. Email “Cruciate curse - injury troubles an early challenge for Sheedy as he begins second spell as Tipperary boss”. Feedback on “Cruciate curse - injury troubles an early challenge for Sheedy as he begins second spell as Tipperary boss”.